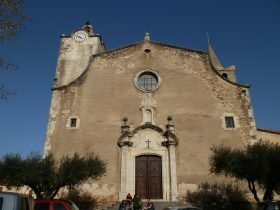 In the early Medieval period La Bisbal was important because it was the seat of the Prince-Bishops of Girona and the area and villages around, rather than being under the control of the Count of Empuries (Comte d'Empuries), were directly under the control of the bishops. As such a number of the bishops had names associated with the local villages (de Monells or de Cruilles). One of the most important of these was Berenguer de Cruilles - the bishop of Girona in 1349 and the first president of the Generalitat de Catalunya - the government of Catalunya - in 1359. People named de Cruilles occur numerous times in Catalan history including important participants in the conquest of Mallorca by the Catalans and as inquisitor general for Spain. 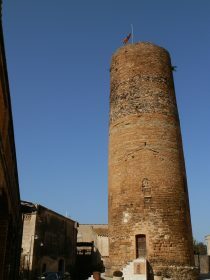 The town of Cruilles now is another pretty, stone-built Catalan village with a large tower in the centre. It's not so large and easy to walk around, though with the exception of the tower and church it's mainly smaller houses so it's not as illustrious as its forebears names would suggest. On this visit, the church tower was under cover behind scaffolding. However, a short walk away is St Miquel de Cruilles, an early Romanesque monastery. We come back this way on the walk. From Cruilles we head out towards Monells. As far as we can see on the map, the only option is to follow a road that links the villages. We tried to make a diversion up the hill then navigate a couple of dotted line tracks, but got stuck and ended up having to walk by the edge of fields to get back to the road, so it's probably best to stick to the road. Monells we have mentioned before in the walk up to Montnegre. The village from the road doesn't look very interesting, but the centre hides arched arcades and stone gates. We walk down one of the old streets to the gate at the bottom to see the stream, before going back under the arches and into the inner court yard where people are eating under the arches. We follow the path out along the stream (similar to the other Monells walk), but take a left hand road past a small cluster of farm buildings. 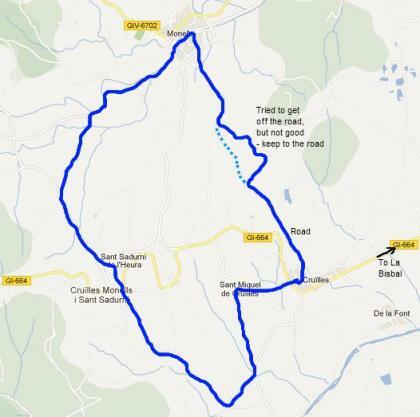 This takes us towards Sant Sadurni de l'Heura, the third of the towns on the route. Sant Sadurni has an impressive 18th century church, and is the chief village of the poblacio made up of the three villages, but compared to both Cruilles and Monells feels a little more run down with fewer hidden streets to explore. We leave the village and cross the main car road, going past two or three restaurants. The car-parks are full with locals out for lunch. 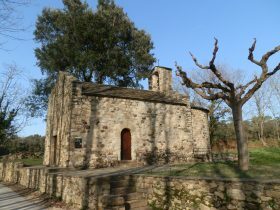 We continue on the track indicated to Cruilles, passing the small chapel of Sant Joan de Salelles (named after Saint John the Baptist - Joan is Catalan for John, a boy's name). As we pass a large masia we reach a crossroads and the flat fields spread out in front of us, framed by the Gavarres hills in the background with views to La Bisbal. Along the track we turn up to the left to visit Sant Miquel de Cruilles. The monestary is famous for being one of the early Romanesque buildings (Romanesque is known as Norman architecture in England). 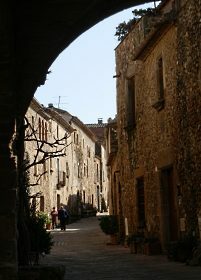 Built in 904, the style is quite muscular and plain, but is characteristic of many older buildings in Catalona and is a style that almost emerged from this part of the world. It was superceded by the Gothic style - much more pointed arches. 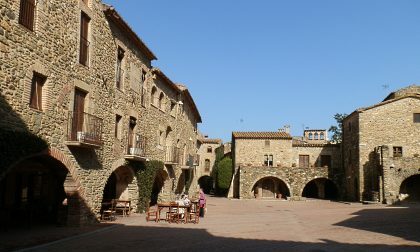 Sant Miquel itself is a small hamlet of 10-15 renovated buildings. The path then runs down the hill, past the pig farm (which sort of ruins the view of Cruilles) and back to the car.